News release courtesy of the Royal Architectural Institute of Canada. 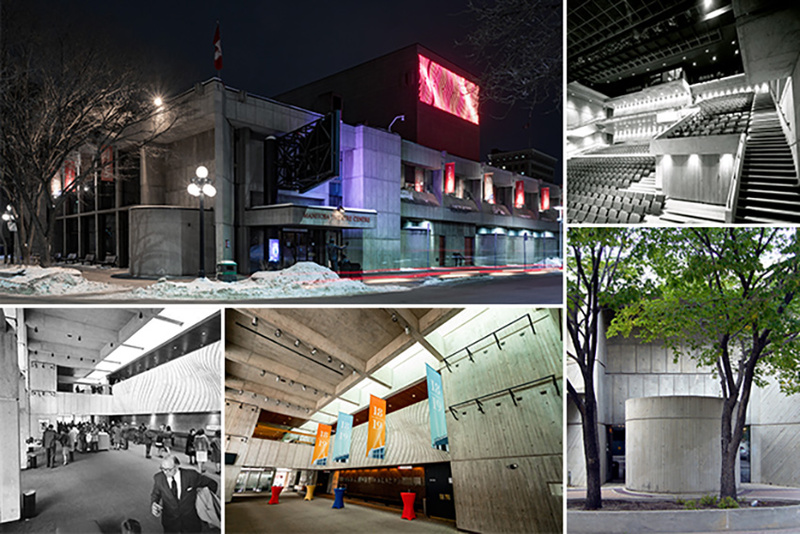 OTTAWA, ON, April 9, 2019 – The Royal Architectural Institute of Canada (RAIC) and the National Trust for Canada announce that the Royal Manitoba Theatre Centre in Winnipeg is the recipient of the 2019 Prix du XXe siècle, an annual award that recognizes Canada’s landmark buildings of the 20th century. The Royal Manitoba Theatre Centre (RMTC) opened in 1970 and was designed by Number TEN Architectural Group of Winnpeg. The theatre company was the first regional theatre in Canada, founded in 1958, and inspired the development of regional theatres across the country. The RMTC is recognized as a National Historic Site of Canada, both for the company’s influence on the development of Canadian theatre and as an expression of small-scale Brutalist architecture in Canada. Principal architect Allan H. Waisman (1928-2017) and design architect Robert Kirby were key members of the design team. Kirby later became Director of the University of Calgary’s Architecture Program. Waisman, born in Winnipeg to immigrant parents, was a founding partner of Number TEN Architectural Group and garnered many awards throughout his career. He was an ardent supporter of the arts and active on the boards of the Manitoba Theatre Centre, the Winnipeg Art Gallery and the Royal Winnipeg Ballet. As an example of the Brutalist architectural style – which originated in 1950s London and became popular for public buildings in Canada in the 1960s – the RMTC is smaller in scale and is described in its nomination as ‘informal and intimate’, ‘unpretentious’, ‘relaxed’, ‘modest and sensitive’. The jury agreed and also called the building a “unique social experiment. It says to all of us that architecture does not exist outside of the material, social and political agendas of its communities. This little building IS Winnipeg, a creative and energetic community of people. It is a gentle, lovely and lovable building.” The jury also praised its “human scale and sidewalk presence” and noted that its owners have been “wonderful stewards” of the building. “The RMTC design has kept its integrity through the years, and it remains a vital cultural hub in its community,” said Michael Cox, President of the RAIC. "Like the company of players it houses, this building is modest, versatile, and full of surprises – BRAVO!" The RAIC and National Trust bestow the Prix du XXe siècle annually to promote public awareness of outstanding Canadian architecture and landmark buildings of the 20th century. Previous winners include the CN Tower, Simon Fraser University, Habitat ‘67, and the Confederation Centre of the Arts in Charlottetown, PEI. PUBLIC EVENT: The Winnipeg Architecture Foundation (266 McDermot Avenue) is hosting an exhibition on the history and architecture of the RMTC until April 26, 2019, open to the public from 9 AM to 4:30 PM Monday to Friday. Richard Moorhouse, Vice‐Chair of Heritage Toronto and President of the Arts and Letters Club of Toronto Foundation. Past Chair of the National Trust for Canada, Toronto, ON. The Royal Architectural Institute of Canada is the leading voice for excellence in the built environment in Canada, representing about 5,000 members. The RAIC advocates for excellence in the built environment, works to demonstrate how design enhances the quality of life, and promotes responsible architecture in addressing important issues of society. The National Trust for Canada is a national charity that inspires and leads action to save historic places, and promotes the care and wise use of our historic environment. Number TEN Architectural Group is an award-winning integrated architecture and interior design firm specializing in design innovation, project delivery, planning, advisory services, and visual communications. We are excited to announce plans for a major renovation to our Winnipeg Exchange District office at 115 Bannatyne Avenue. The goal of the 14,000 sq. ft. renovation is to enhance the client and employee experience while improving our internal team processes to serve our clients better. To achieve this, the design team set out to create a new open work environment where architects, interior designers and technologists can better work together, collaborate, and support each other. The new design will provide a mix of large and small meeting spaces with integrated technology, a unique reception area feature wall and a central workplace café designed for informal interactions between employees, clients and visitors. The smaller fourth floor will be converted into a dynamic makerspace complete with a flexible project research centre, and a new library for organizing design resource materials and product samples. The design process included a series of creative staff engagement workshops to gain insight from employees into what matters most to them in the workplace. The results highlighted a series of themes to guide Number TEN’s internal design team. The renovation provided an opportunity to reinvigorate the office with a fresh modern-classic design style that compliments the historic features of the 1899 Donald H. Bains building, where Number TEN has been proudly located for over 35 years. To ensure the highest standards of occupant health and wellness, Number TEN’s office renovation is pursuing Fitwel® certification: a globally recognized program that promotes the optimization of buildings to support heath and wellness among building users. Fitwel strategies include increasing access to natural daylight, incorporating direct and indirect LED lighting, upgrading mechanical systems, and providing a variety of workstyle options including multi-height tables and sit-stand workstations. The new design will also create a more universally accessible workplace for staff and visitors alike. Construction for the new office renovation begins March 4, 2019 and is expected to be complete by August 1, 2019. During the construction phase, Number TEN’s Winnipeg staff will be working from Camp 10 – our temporary office located around the corner at 200-200 Waterfront Drive. Manitoba’s skilled trades industry got a major boost with the official grand opening of the new Skilled Trades and Technology Centre (STTC) on November 15, 2018. The 104,000 sq. ft. building is designed to offer cutting-edge training for over 1,000 students per year in high-demand trades that are a vital component of Manitoba’s economy. The project, designed by Number TEN Architectural Group in association with Pico ARCHITECTURE inc. and a multidisciplinary consultant team is the result of a five-year collaborative process involving a large stakeholder group including key representatives of RRC’s administration, instructional staff and students. Construction of the STTC was led by Akman Construction and included over 60 subtrade companies as well as key contributions from Red River College students involved in skilled trades programming. In addition, approximately 75 percent of the more than 1,000 workers who helped construct the building are alumni of RRC programs. The building is oriented around a sky-lit central galleria which serves a two-storey pedestrian street that spans nearly two-football fields in length, flanked with floor to ceiling windows offering views into the each of the state-of-the-art workshops organized by trade discipline. The design not only celebrates the skilled trades and technologies through its transparent and carefully integrated building components, but also serves as a teaching tool by providing opportunities for learning and hands-on interaction. Features such as sensors in walls, ceilings and windows provide real-time data for students studying how the building interacts with the external environment. 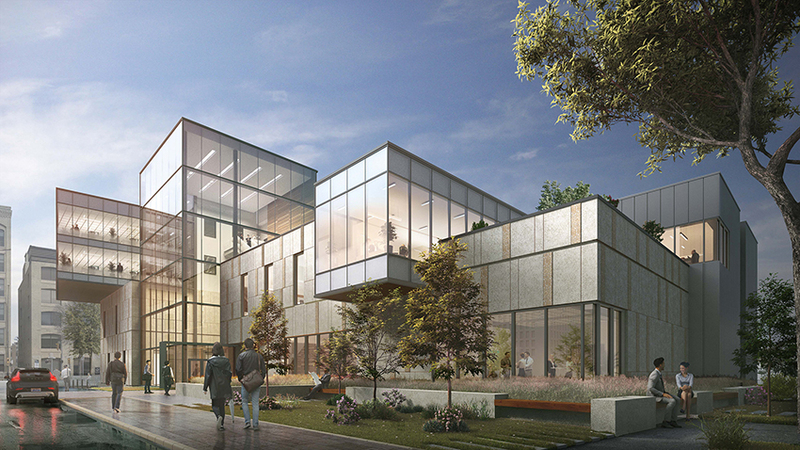 The building’s exterior is designed to be a focal point at Red River College’s Notre Dame Campus, offering a signature design statement that expresses the college’s commitment to innovation, training and applied research. “The seemingly random patterns of black, white, and wood-coloured aluminum panels and windows were inspired by the visual cues from a birch forest and was done quite intentionally to create a non-institutional feel and make a more informal and inviting environment for students,” said Hanna. In addition to the main building is the 6,000 sq. ft. Smart Factory, set to be completed in early 2019. The Smart Factory will combine emerging technology including robotics, automation, additive manufacturing, high-speed robotic inspection and industrial networking to support research and applied-learning. Sustainability was another crucial design driver for the STTC project, with a variety of design features that improve energy performance by 34.6 percent compared to the National Energy code reference building. The STTC, currently targeting LEED® Gold status from the Canada Green Building Council (CaGBC), recently earned a Green Building Excellence Award in Green Building Construction by the CaGBC for its application of sustainable design strategies. BC Housing announced on November 13, 2018, projects that were selected for the Building BC: Community Housing Fund. Much like past investments in co-op and non-profit housing, individual buildings will contain units aimed at a mix of income levels, including homes for middle-income individuals and families, deeply subsidized rentals for seniors and others on fixed incomes, and homes for low-wage workers. 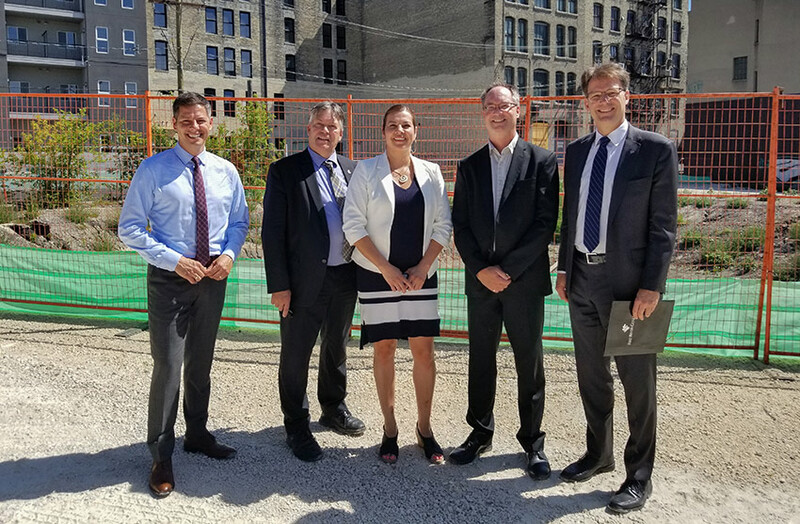 The Province’s new Building BC: Community Housing Fund, a $1.9-billion investment over 10 years, will build more than 14,000 affordable rental homes for seniors, families and low- and middle-income earners, with many to include child care. These 4,900 homes, the first set of projects selected through this fund, will include both non-profits and co-ops, and will be built over the next two to three years. $5.8 million to the Gorge View Society who are looking to add 58 homes for families and seniors on their property at Chown Place. They have operated 100 suites for seniors for the past 50 years on their property at 11 Chown Place in the Burnside Gorge neighbourhood of Victoria. $2.4 million to the Rogers Court Society who are planning on 24 homes for non-profit seniors housing at the Anglican Diocese's property of St. Peter & St. Paul's in Esquimalt neighbourhood of Victoria. This project envisions a new campus that incorporates a heritage designated church, a new Ministry Centre and 24 units of seniors housing. Number TEN has been awarded the design contract for two new education facilities for Nisichawayasihk Cree Nation, a vibrant and thriving First Nation based in Nelson House, Manitoba, about 800 kilometres north of Winnipeg and 80 kilometres west of Thompson. The two new schools will be designed to meet projected student growth increases in the community and will replace an existing school that is nearing the end of its useful life. The project includes a new 5,613 sq. m. grade 7 to 12 school with a capacity of 476 students, a new 4,828 sq. m. Kindergarten (K4/K5) to grade 6 school for 587 students, and 1,660 sq. m. of new housing for teachers. Project Manager: P.M. Associates Ltd.
Civil Engineering: Neegan Burnside Ltd. The office is designed to integrate leading edge-technology, encourage collaboration, and enhance the overall client experience. To achieve this, the office’s three floors are organized with efficiently planned private offices sharing daylight and views with a variety of multi-functional meeting and administration spaces. A sky-lit, interconnecting staircase in the center of the floor plate encourages casual office interaction leading to impressive staff and client amenities on the 17th floor atop True North Square. A dramatic 16-ft-high vaulted ceiling and Manitoba Tyndall stone wall will greet TDS’ clients when they visit the top floor. TDS’ new client experience provides an array of comfortable sitting areas, private meeting rooms, flexible conference rooms and access to a state-of-the art café and gathering space called The Northern Lights Lounge. Large revolving glass doors will open up the space, allowing TDS to host industry events and client gatherings. Working with Toronto-based design firm figure3, Number TEN’s Workplace Interiors Studio was able to achieve all critical milestones on a challenging schedule that involved close coordination with True North’s base building design and construction teams. “There was no margin for error with a tight move-in schedule for TDS. Our multidisciplinary team pulled out all the stops and managed to overcome significant obstacles to make it happen. We are very proud of the results achieved,” said Hasiuk. To learn more about TDS’ new space, please visit our projects page. To learn more about TDS, visit www.tdslaw.com. Shovels hit the ground Wednesday July 18 at Red River College’s Exchange District Campus, on the site of what will become the new Innovation Centre @ RRC. In front of a distinguished audience of dignitaries and project stakeholders, RRC executive director of Indigenous strategy Rebecca Chartrand blessed the site on behalf of campus elders. The new Innovation Centre is designed to foster collaboration between students, faculty, industry and the community, leading to new ideas and partnerships that support the college’s goal of preparing students for the job market and moving local industry ahead of the curve. Designed by Number TEN Architectural Group and Diamond Schmitt Architects inc. in joint venture, the facility’s striking design features will capture the imagination of both building users and passersby. Images: Number TEN partner Doug Hanna speaks prior to the blessing ceremony | Rendering of the project interior "Agora" space. Among the project’s most ambitious goals is its net zero energy target – a first for a project of this scale in Manitoba. A net zero building is one where the total energy consumed annually is approximately equal to the amount of renewable energy created on the site and returned to the grid. To learn more about this exciting project, visit our projects page. Number TEN partner and Hospitality / Entertainment Studio lead Dave Lalama was recognized as a Fellow of the Royal Architectural Institute of Canada (RAIC) - the leading voice for excellence in the built environment in Canada. The fellowship recognizes outstanding achievement in design excellence, exceptional scholarly contribution, or distinguished service to the profession and community. Dave was one of 40 architects across the country, and one of two in Manitoba, to earn the prestigious fellowship. The Number TEN Partners are very pleased to announce Leslie Myers as a new associate in the firm. Leslie is the lead interior designer in the firm’s Victoria Office and possesses a balance of experience and skills that translate into great client service and continued success for our firm. As an associate Leslie will broaden her involvement in firm-wide strategic planning, firm management, and leadership succession. Leslie has grown the Victoria office's interior design practice during the past five years and has recently achieved her professional NCIDQ certification. 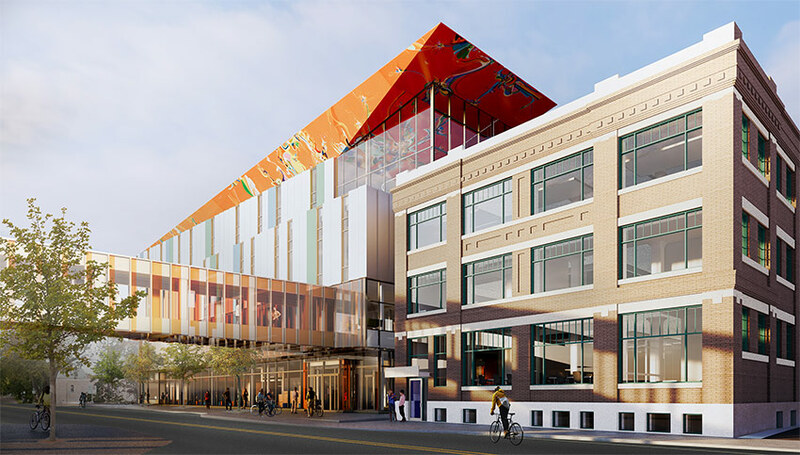 Currently, the Victoria office’s interior design work has been focused on a range of BC government projects including the redevelopment of the historic Queen’s Printer building in downtown Victoria. Read about the interesting story of the Queen’s Printer project on Number TEN’s Inspired blog. Creative director and associate Brent Bellamy was selected to be part of an esteemed jury for Infrastructure Canada's Smart Cities Challenge, which encourages communities to adopt a smart cities approach to improve the lives of their residents through innovation, data and connected technology. Brent was invited by Canada’s minister of infrastructure and communities to be part of the twelve-member jury to advise on the selection of finalists and winners of the Smart Cities Challenge Canada. Number TEN practice leader Greg Hasiuk has been nominated and selected as a prairies region finalist for Ernst & Young’s Entrepreneur of the Year program, which recognizes the achievements of Canada’s top entrepreneurial talent. Greg will join the other distinguished regional finalists at the Prairies Entrepreneur of the Year gala in Calgary on October 18. Three Number TEN staff members achieved Leadership in Energy and Environmental Design® (LEED) green associate status from the Canada Green Building Council. Aruna Anaparti, Laura Thomson and Sian Porter earned the credential in recent weeks, bringing the firm’s total number of LEED certified staff members to 23. Residential / Commercial Studio lead Laurene Bachand and architectural intern Aaron Pollock played leading roles in organizing Winnipeg’s On the Docks; a campaign to engage community members and design professionals to develop ideas for the redevelopment of Winnipeg’s derelict Alexander Docks site. Check out their recent interview with CBC news. Laurene and Aaron also placed as finalists for the Winnipeg Architecture and Design Film Festival’s Archishorts competition for their independent entry titled Beige City. Partner Doug Hanna is serving as the MAA’s new treasurer, while architectural intern Aaron Pollock is appointed as intern representative. Designer and intern architect Erin Riediger recently completed her tenure as student representative. The MAA is a self-governing professional association, mandated by the Province of Manitoba under The Architects Act to regulate the practice of architecture in the province. Long-time Number TEN contract administrator Craig Bachynski received the CCCA (Certified Construction Contract Administrator) designation from Construction Specification Canada (CSC). The professional certification attests to Craig’s knowledge of recommended practices in organizing, implementing and supervising construction contract documents, as well as expertise in written communication. 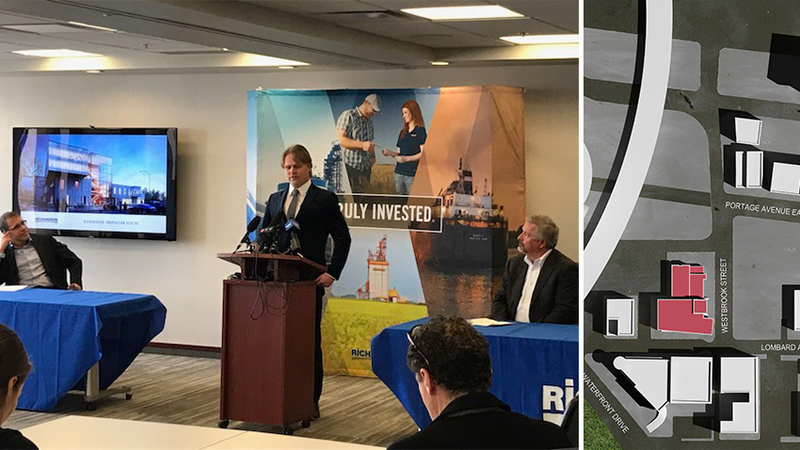 Richardson International announced plans to invest more than $30 million to develop an innovation centre in the heart of downtown Winnipeg, featuring state-of-the-art technology and equipment for research and product development. This world-class facility, designed by Number TEN Architectural Group, will complement Richardson’s food and ingredients division and will provide an extensive opportunity for industry collaboration. The new centre will not only facilitate agri-food research and product innovation, it will help invigorate the downtown area and serve as a lasting legacy for the Winnipeg community. The four-storey, 5,800 square metre (62,000 square feet) facility will house Richardson’s food development team, product development suites, analytical laboratory and a culinary test and demonstration kitchen. To support Richardson’s quality assurance and food safety teams, the centre will boast a cutting-edge microbiology lab and an extensive quality analysis area. The building will also include office areas with room for expansion to focus on innovation such as the increased use of robotics and automation in food packaging and processing. The strategic positioning of these core departments within the same multi-level space will optimize research, analytical and educational activities and facilitate the efficient development of truly innovative products. Located at the corner of Westbrook Street and Lombard Avenue, the Richardson Innovation Centre will be in close proximity to Richardson’s head office at Portage and Main. Construction will begin in April and is targeted for completion by the spring of 2020. Richardson is Canada’s leading agribusiness and is recognized as a global leader in agriculture and food processing. The company is a worldwide handler and merchandiser of major Canadian-grown grains and oilseeds and is a vertically-integrated processor and manufacturer of oats and canola-based products. Over the past two decades, Richardson has become a significant player in the global food business, producing a wide variety of food products and ingredients for the retail, foodservice and industrial markets. One of Canada’s Best Managed Companies, Richardson is headquartered in Winnipeg with over 2,600 employees worldwide.